What in Mungo Jerry’s name is mochi? Like many of the best things that have heralded from The Land of the Rising Sun, mochi’s origins lie in the humble grain of rice. The greedily named glutinous rice to be precise! This rice is pounded into a paste and subsequently assembled into various different shapes. Manifesting in many forms and popping up in an array of savoury and sweet dishes, mochi is a delight that’s well loved in its homeland and increasingly abroad too. The process of making mochi is startlingly exciting. Firstly, polished glutinous rice is soaked overnight and subsequently cooked (which isn’t very exciting). 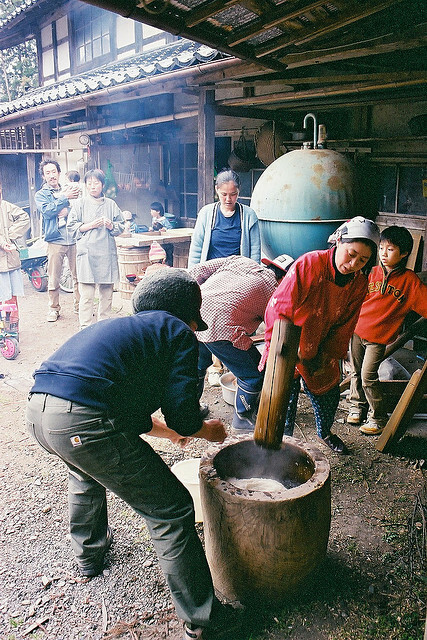 Then, the whole community gathers round and watches as the mochi makers transform the mulsh into mochi. This involves two people relentlessly and vigorously attacking the cooked rice using wooden mallets (known as kine) and a large mortar (usu). Regularly, one of the mochi makers is assigned the daunting task of flipping the mochi and adding water to it whilst their companion keeps on incessantly striking. This is a dangerous, terrifying and deeply entertaining spectacle. No wonder so many people turn up to watch! Mochi making is undertaken in schools and community centres throughout Japan in the build up to New Year. It brings the community together and transcends age groups. After the madness of the mashing, the resulting mochi is divided into squares (the preferred style in the North of the country) or into rounded shapes (the style approved down South). What’s the history of mochi? Mochi has been around for thousands of years. Its association with New Years goes as far back as the Heian period (794-1185). It was mentioned in the 11th century novel The Tale of Genji . A folk tale from the Nara Period highlights mochi as a sacred food and tells of a man who tried to use rice cake as target practice. Before his arrow hit the mochi, it turned into a swan and flew away. Then rice crops in the area failed and people starved to death. The moral of this story is that you should respect mochi and not waste it… or use it for target practice. Mochi was seen as a luxury reserved for the nobility of Japanese society. It is made from mochi-mai rice. This type of rice has a lower yield than the uruchi-mai that we more commonly eat. This scarcity meant that the rice was more expensive and thus a cake made entirely from mochi-mai was the symbol of happiness and good luck. The importance of mochi can also be seen in the belief that a giant rabbit can be seen on the face of the moon pounding mochi with a giant rabbit sized kine and usu. Move over angry birds! Kagami mochi the app’s in town. Cheers Big Suze! Mochi is also particularly popular as a treat around the New Year’s Eve period. 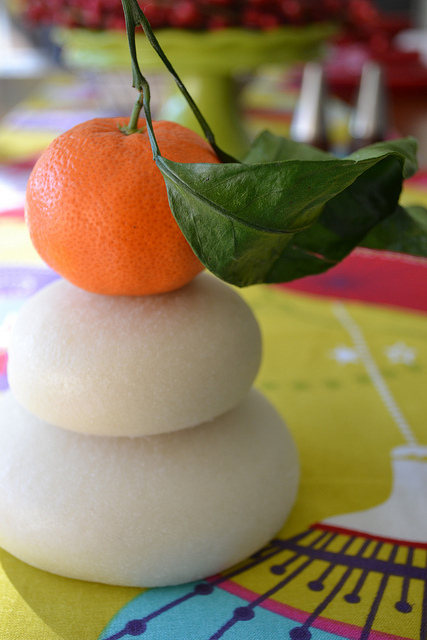 It’s even used as decoration, in the form of kagami mochi, where two mochi discs are placed on top of one another and an orange is plonked on the top for good measure. 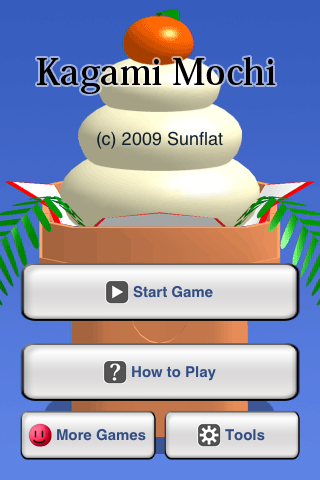 Whilst this practice has been occuring for centuries, in a brilliant modern twist mochi enthusiasts can now download an app which consists of arranging the kagami mochi. Very modern, very tech! Read on to find out more about our very own kagami mochi decoration, available in store and online. 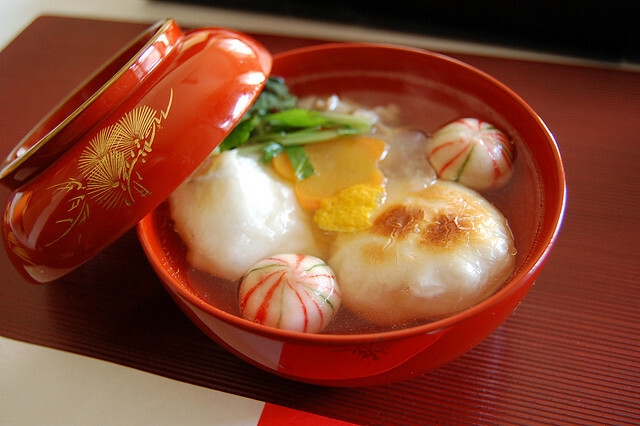 Ozoni: This soup contains mochi cakes floating in a flavoursome broth. It is said that ozoni has its roots in samurai culture and is the most auspicious of meals eaten on New Year’s Day. On okonomiyaki: An example of mochi as a wonderful addition to savoury dishes, there’s nothing quite like mochi parcels oozi ng over a freshly fried Japanese pancake. Try adding to one of our multiple okonomiyaki recipes. Looking at this popular and endearing treat from Nippon, one wouldn’t assume mochi had a dark and sinister underbelly. However, when chowing down on mochi, one should keep one’s wits about…one. It’s sticky. Very, very sticky. Tragically, every year around the New Year’s period, a smattering of senior citizens meet their maker when eating mochi. 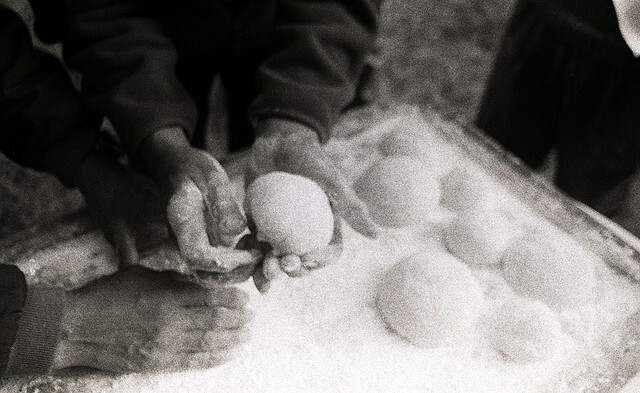 In 2011, six people died and eighteen were hospitalized in mochi related incidents. The fire services even issue annual warnings, advising folk to cut up their mochi and not to eat it alone. So mochi fans, take heed. Never underestimate the power of mochi! Even if it can be a merciless killer, we still love mochi with all our hearts! And we want to share it with you too. There’s heaps of mochi options at Japan Centre, both in store and online. We’ve got mochi rice cakes in both square and spherical versions to appease both Northerners and Southerners. We’ve also got mochi rice, chocolate mochi truffles, savoury mochi snacks and mochi mochi more! We’ve also created a marvellous mochi making kit, with all the bits and pieces you need to make delicious daifuku truffles with chocolate or azuki red bean paste filling. Perfect for the amateur cook and simply wonderful Christmas gift. In the spirit of Japan, we also have our own mochi making sessions in store on the 2nd of January! Find out more about this remarkable New Year’s event here. Fancy your own kagami mochi decoration? We’re now stocking kagami mochi in store and online! Come and see mochi making in store! We’ll be hosting a very special New Year’s celebration in Japan Centre Piccadilly on the 2nd of January. Find out more here. Do you love mochi? What mochi dish gets you most excited? At Japan Centre, our array of online mochi madness should satisfy the most mammoth mochi cravings. Thanks to Miyaoka Hitchcok at flickr for the kagami mochi app image. Thanks to Valerie Kamikubo at flickr for he kagami mochi image. Thanks to so Sara says at flickr for the mochi hammer image. Thanks to Eat Me Drink Me at flickr for the black and white mochi image. Thanks to Deven at Vine for the making mochi video. Special thanks to Susan Fogarty for her knowledge and expertise on the history of mochi. Posted in Food and tagged Japanese cuisine, Japanese mochi, kagami mochi, mochi, okonomiyaki. Bookmark the permalink.